I've known Alana for about ten years. She loves to travel. She's a teacher, and every Spring Break and summer she would go on amazing adventures around the globe. She recently welcomed twins into the world, but appears to have no plans of letting that slow her down travel-wise. My husband has been trying to convince me to return to Costa Rica now that we have a little one. It's a gorgeous country that has a special place in our hearts, since it is where we got engaged. I've always brushed aside the notion, convinced that it would be "too hard" with a little one. And then I saw the most stunning vacation photograph I've ever seen on Instagram - Alana's husband and her two twin babies relaxing in a lush tropical paradise. And I said to myself "I must go there!" I instantly wrote Alana and asked two questions - 1) Where are you?, and 2) Can I interview you for my blog? 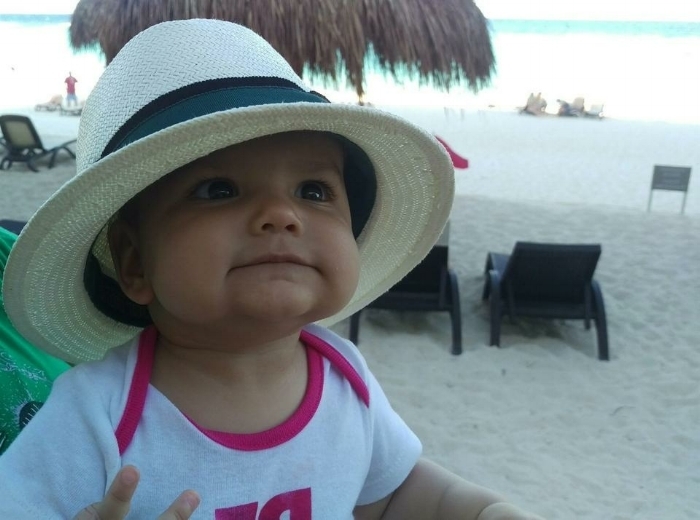 Because she is truly inspiring, and her family (and the Hacienda AltaGracia resort) are proof that you really can travel fabulously with little ones. Even twin little ones! What made you decide on Costa Rica's southern region as your travel destination? The resort. I'm the queen of deals, and found a heavily discounted deal for the Hacienda AltaGracia. It is a relatively new property within the Auberge resort portfolio. Daryl and I stayed at one of Auberge's other properties for our honeymoon, which was spectacular, so I was familiar with the brand and their calibre of hotels. When I saw this incredible deal for the Hacienda AltaGracia come into my inbox, I said to myself "I need to try the nicest hotel in Central America. I just did a year with twins." So I told Daryl "We're going to Costa Rica!" It was hands down the nicest place that we have ever stayed in the whole world. (Editor's Note: Hacienda AltaGracia was named Best Hotel in Central America in 2017 by Travel + Leisure magazine. Through Travelzoo, visitors can book rooms for most dates between April and August 2018 for $200/night USD, a steep discount over the regular $600/night rate. Bookings must be made by April 18, 2018). How did you get to the resort from the San Jose airport? We rented an SUV and drove. It's about a 3.5 hour drive, so with some baby breaks and going to the grocery store, it took us about 4.5 hours. I'd definitely recommend an SUV with 4-wheel drive, since the drive into the resort is on gravel roads at the very end. Costa Rica's main highways are excellent. If you end up turning around, though, you may end up on dirt road. (Editor's note: The resort does offer private charter flights from San Jose and Liberia to its own private airstrip, and short regional flights are also available between San Jose and a local airfield near the resort. The resort provides detailed information on flight options, including flights from North American destinations to San Jose on its website). You didn't find it difficult to drive in Costa Rica? When my husband and I traveled to Costa Rica's Arenal region, we were advised by friends to get a driver rather than drive ourselves. Not at all. There's no erratic driving, people actually drive so slow. There are places up in the northern parts of Costa Rica that can be a bit trickier and treacherous to navigate, especially in areas around the volcanos and jungles, but we didn't encounter issues in the south. It was very cruisy, with just one windy stretch. If you had to pull over and ask for directions somewhere, you'd probably find that most people spoke Spanish with very limited English in this region of Costa Rica. But locals are used to tourists speaking English, so if you have some basic Spanish skills, you should be able to get along alright. Would you describe Hacienda AltaGracia as baby and toddler friendly? 1) They adore children. My girls were the most popular people in the entire resort. Everyone wanted to take care of them - the resort was very welcoming and accommodating of our two rambunctious babies. 2) You have your own villas, so your kids can cry as much as you want, and no one can hear, which is ideal if there's crying at nap time or at night. That's what I was looking for - a hotel where we had no adjoining walls with anyone else. 3) Excellent blackout blinds, and air conditioning. They napped so well, and slept well at night. 4) The resort came equipped with amenities like cribs with super comfortable mattresses - way nicer than our mattress at home. The dining rooms had high chairs, though there were none in our casita, which would have been nice. Do you think you could have asked for highchairs in your casita? We did ask. They only have two high chairs, so they weren't able to accommodate that request. We did bring lobster chairs though, which we clipped on to the table out on the terrace. But, if I were to give the resort any suggestions, it would be to get more high chairs. Also, I will say that the mattresses in the crib were quite high, so older babies couldn't really have slept in them, since they could climb out. That would be an issue for us. Any other baby and toddler friendly features of the resort? The casitas have a butler's pantry with a sink and fridge - enough to warm up food and keep it cold (Editor's Note: Only the casitas, not the suites, have a butler's pantry). The resort has three pools - one being a family pool with a small shallow end, which was perfect for the girls. The water went up to their tummies when they were standing up. We'd bring floaties with us to the pool and stay close to them while they splashed around. There was a restaurant at the pool, so if your kids were a bit older, you could sit and eat poolside while your kids played around in the water, though we had to be in the pool with our girls. And the pool was well shaded, which is great for little ones. So that was the highlight. Which is sad, right? That the highlight is that it was really easy to keep the routine with our girls, thanks to cribs, and blackout blinds, and air conditioning. But it's not sad though. Because its not a vacation if your kids are miserable. How mobile are your girls? One is full on running, while the other is crawling and standing - and a climber. Given their mobility, did you have any safety concerns within the rooms or resort for your girls? No. The casitas are "free range", though, meaning they aren't fenced in, and there are gardens around them, so older toddlers could certainly roam away from the villas. There aren't any super steep embankments or cliffs around the villas, but they still are set into the hills. There are casitas lower down on the property (ours was nestled higher up on the hill giving us spectacular views), so if you were concerned and wanted to be on flatter terrain, it would be worth making the request to the resort. And no poisonous snakes or anything? The area looked pretty jungly. (Laughs) No. In fact, there weren't even any bugs. I'm not sure how the resort managed that, given it's location. Also, since the hacienda is in the mountains, it's actually relatively cool. It was approximately 25 degrees Celsius (77 degrees Fahrenheit) during the day, when we visited in March. They do, although we didn't use it. The fee is super reasonable, $20/hr USD. Guests don't need to give a lot of notice. And the woman that was doing the babysitting was so lovely - she was a trained kindergarten teacher. I'm sure she'd be a much better parent than I am (laughs). Were there any other families at the resort? There were lots of families there with older kids, I'd say 9 to 13 year olds. It was great because this meant there were lots of kids that wanted to play with the girls. What room type did you stay in? Did it meet the family's needs? We were upgraded to Hacienda AltaGracia's one bedroom Premium casita. The casita has a living room as well as a bedroom, and a big beautiful terrace that we ate outside on, and relaxed on in the evenings. We did have to share a bedroom with the girls, though the walk-in closet was big enough that we probably could have put them in there. But they slept fine, considering they were in a new space. Actually, the one minor downside was that the room doesn't have a bathtub, and my kids love the bath. The room would have been absolutely perfect if it had a bath. The girls don't take a lot of showers, so they were a little afraid of it. It was a massive rain forest shower, which was a bit intimidating. Actually, neither place we stayed in Costa Rica had a bathtub, I think it's just not a bathtub country. If we had to, we probably could have washed them in the kitchen sink, since it was big and clean. (Editor's note: The One Bedroom Master Casitas are the only rooms with a jacuzzi bathtub. The Hacienda AltaGracia does offer one two bedroom casita for families wanting a separate sleeping space from their little ones, though it does not have a bathtub in either of its en suite bathrooms). Bathtubs are hard to find in Costa Rica. I think it has a lot to do with the country's push for water conservation as part of its ecotourism initiatives. True, that might be the case. What did the girls love most about the resort? The pools. We'd go 2-3 times a day. It was really easy to get there. The pool is two minutes away from the villas, and you can call for a golf cart to take you anywhere on the resort - we didn't use our stroller once. It wasn't a highlight for them, because they didn't clue in, but the jungle runs through the pool area, and there were monkeys playing in the trees while we were swimming in the pool, which was really special. Sadly, the girls never saw the horses. The resort feeds the horses every day at 11am, but that's when the girls nap. For kids that only take an afternoon nap, I'm sure the horses would be a big draw. What complimentary activities did you and the family take part in? There are a ton of complimentary activities offered by the resort - hikes, horseback rides, classes on "make your own exfoliation mask", meditation ... mountain biking in the mornings. To be honest, Daryl and I were both too EXPLETIVE exhausted and still in survival mode with twin babies to partake in any of it. We preferred just to hang out. As I mentioned, Hacienda AltaGracia has three pools. One was a gorgeous infinity pool overlooking the most stunning landscape. We actually didn't go there with the girls, since it's adults only. The resort had a spa at the top of the property, with an amazing lap pool, gym, sauna, and steam room. Daryl and I would take turns and go there during the girls' naps. How was the food at the resort? It was so good, and very fresh. (Editor's note: The resort's restaurant, Ambar, is a farm to table concept restaurant). Breakfast was amazing (a la carte), and was included in our deal. We would go to breakfast with the girls and then pack some extra food to take away to our villa, which we'd feed to the girls throughout the rest of the day. We'd do lunch by the pool, and every evening for dinner we would order room service and eat with the girls on our terrace. They can do one meal out per day. Any more than that and it gets exhausting. I know some parents are better with dining out with kids, but they just get so messy, and are so tired at the end of the day. The restaurants serve both "American" and Costa Rican options. Prices were less than I had imagined, given the luxury status of the hotel, and the fact that you were in the middle of nowhere. For lunch, you could have a filling quesadilla for $14 USD. Drinks were also affordable, about $6/beer. Dinner was pricier, but still less than the equivalent hotel restaurant would have been in the US or Canada. Were there any downsides to the resort? Laughs. Uh, no, definitely not. It was perfect. All the staff knew the girls by name, which we loved. Would you recommend Hacienda AltaGracia to other families traveling with babies? Totally! The girls were really happy at the resort. The resort was so accommodating of our young family, and so prompt to address any questions - because I asked a lot of questions before booking. And you'd recommend it for families with toddlers? It is far from the beach, so it is a different vacation experience, but the plus side is that it was cooler, and so tranquil. Any suggestions for families looking to stay at Hacienda AltaGracia? Because it is a long way to travel, with the flight and the drive from the airport, I would definitely recommend planning to stay for a minimum of 3 or 4 nights, so that you can relax and unwind. You could possible stay for a shorter time if you flew into the resort. You don't need a car when there, since there are so many complimentary activities to enjoy. You could easily stay on resort the whole time and never be bored. I could definitely have stayed there for nine days and been perfectly happy. We never used our stroller once at the resort. You may want to bring a carrier, though - there are lots of paths where you could take the kids for a walk, but I'd recommend the carriers for those less stable on their feet. Hacienda AltaGracia suites start at $600 USD per night casitas start at $699 USD per night.